Use the builder brush to make the volume. The pivot of the brush will be used to define where the inner marker box will be made from. 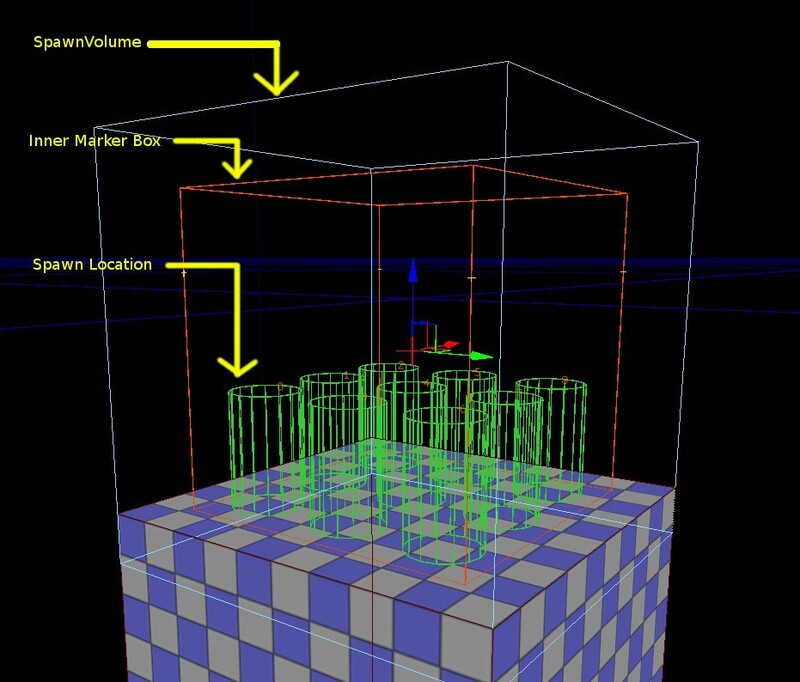 Within the inner marker box, the spawn location visualizers will be placed. As a rule of thumb, we use 640x640 volumes to start with. We then adjust the pivot to be in the correct place so that the inner marker box will be drawn where we expect to. We then, typically, oversize the volume to allow for the players to be able to touch the volume when they are passing through a particular area. The touching of the player(s) will shut off the volume from being used. Largest Squad Type: the largest type of Zed that will come through this volume. 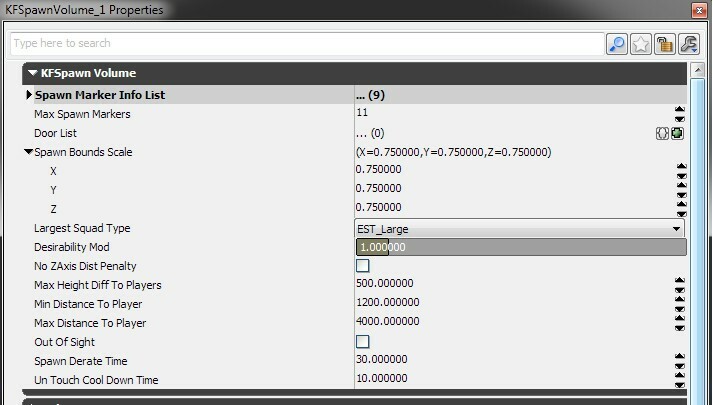 It will select the largest and anything smaller than it, when the spawning system decides where the Zed will be spawned. 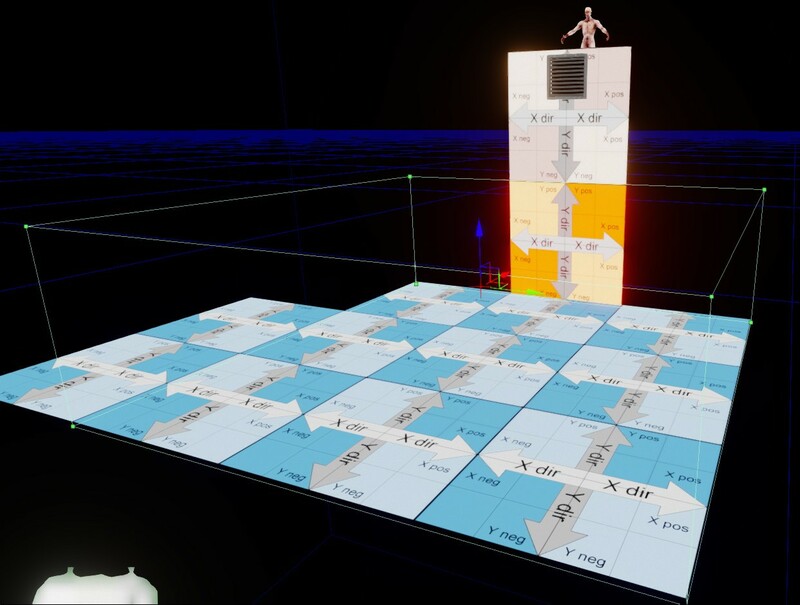 The KFSpawner is a specialty spawn tool that is used to have Zed emerge from floors (sewers), walls and ceilings (air vents). They have special animations associated with them and have to set up very deliberately with very little lateral as to their alternative use. 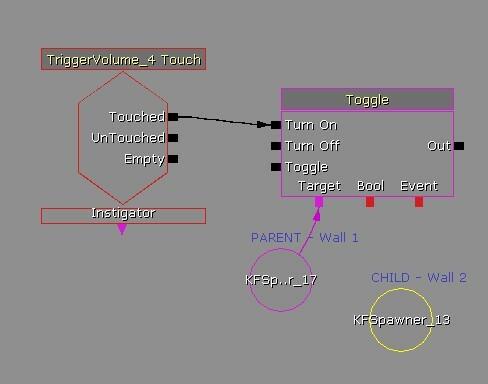 The SDK map has all types of KFSpawners set up with associated TriggerVolumes. From a practical setup standpoint, you should just have to copy and paste it into your map, and rotate it to the appropriate direction. There are four types: high wall, low wall, floor and ceiling. A TriggerVolume has to be made from the builder brush that encompasses the space that any particular KFSpawner is going to be used in. 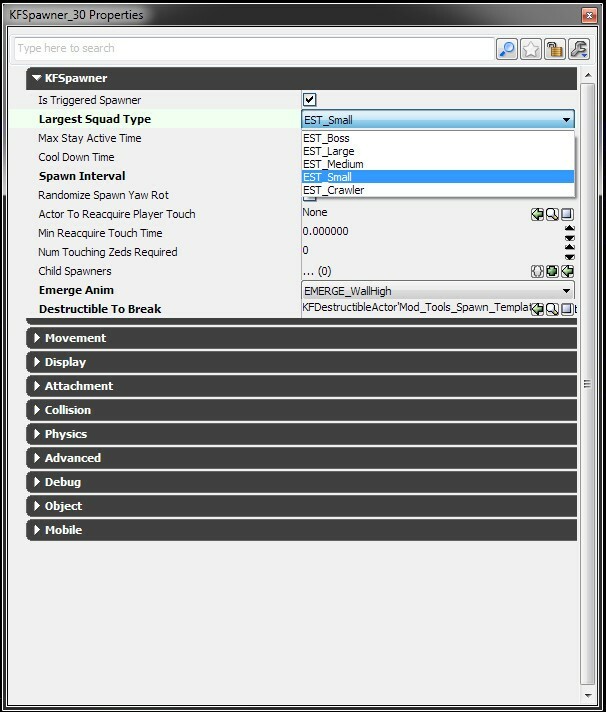 The reason for this is that the TriggerVolume is used to trigger the KFSpawner active (See Kismet requirements) as well as being used to track that a player is in the area that KFSpawner is going to be used in. All the details about a child KFSpawner is inherited from the Parent. To make a child spawner work correctly, it must have the Is Triggered Spawner unchecked and be in the Child Spawner array of the parent. A Boss Volume is simply a typical KFSpawnVolume with the largest zed type set to Boss. The volume must have at least 4 spawn markers in it. The volume, also, must be in a place where a cinematic camera can operate appropriately.